Although this temple hasn’t got a long history attached to it, the attraction & pull of this Mandir remains unrivalled, especially during the festival of Navratras. It all started when a young boy in Karnataka was orphaned at an early age & was told by someone that the real mother who can protect him & remain with him forever is the Mother Goddess. That was enough to set him on the path of unflickering devotion to Maa Durga. He was later taken under the wings of spiritual masters, educated & initiated into the Shakti cult & was known to the world as Baba Sant Nagpal Ji. Chhatarpur Mandir was the culmination of his dreams & with the blessings of the Goddess, the construction started in 1974; and before he breathed his last in 1998, he had built the largest temple complex in the world, which was later surpassed in 2005 by the Akshardham Temple. This temple is nevertheless one of most popular places of worship in Delhi & North India especially during the 9-day Navratri festival; more than a million people throng this temple for a glimpse or Darshan of the Goddess Katyayani. The Darshan of the presiding deity is possible only during these nine days or Ashtami of every month according to the Hindu calendar. The temple remains open on all days of the week throughout the year from 4 AM-12 Midnight. On Navratri & other Hindu festivals, more than 1 Lakh devotees are served free meals each day. 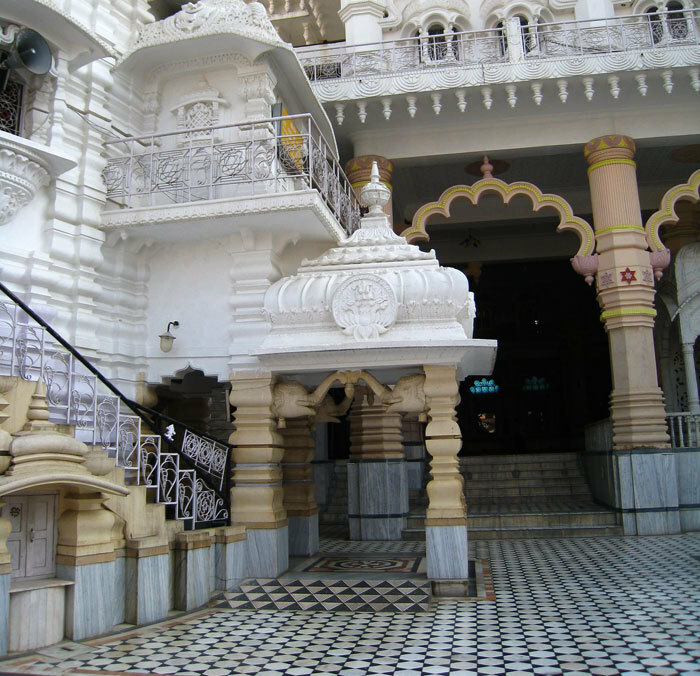 The temple architecture follows both South & North Indian styles and white marble of the finest quality has been liberally used for construction. The Gopurams of the South and the intricate lattice and Jali work of the North are carved on the temple exteriors and the structures look beautiful and majestic. Right near the entrance, a wish fulfilling or Kalpavriksha tree greets you, its branches adorned with sacred threads & bangles, each signifying a wish request to the tree. 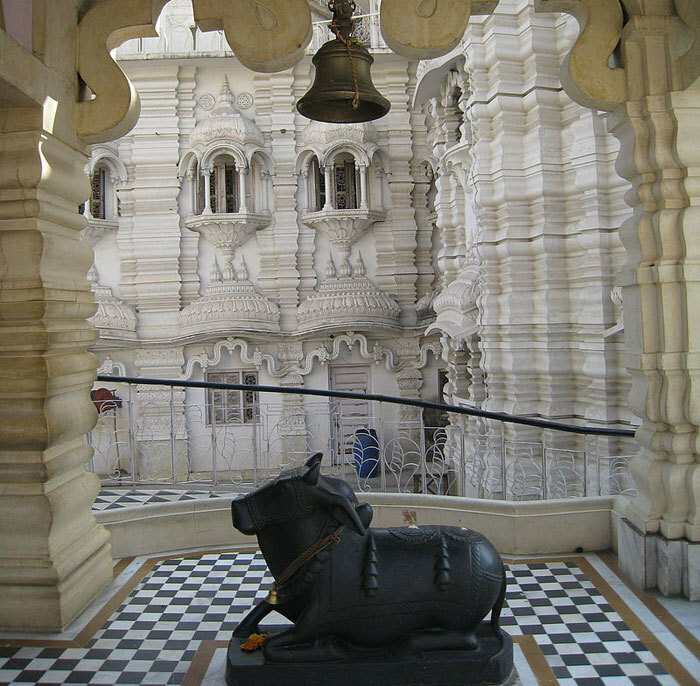 The Main temple building has the shrine of Goddess Katyayani along with two portions containing a sitting room & a bedroom with all silver furniture. For everyday Darshan, Maa Gauri, another Avatar of the Goddess, is possible in the mornings & evenings. Altogether the 70 odd acres of the complex holds 20 major & minor temples dedicated to different Gods & Goddesses in the Hindu pantheon. From Rama Darbar to Lord Shiva; Laxmi to Radha Krishna, all are included; & the Hanuman statue rises 100 Ft tall to bless all those that pass by. The place where Baba had his private quarters & where he breathed his last has been converted into a museum as homage to the great soul. The dining hall & kitchen occupies a very large area where thousands can sit down together for a meal or Prashad (food offering), which is first offered to the deity before serving. Besides the temples, the dazzling & sprawling green lawns are kept immaculately clean & are well maintained. A Delhi visit is surely incomplete without going to the Chhatarpur Temple Temple.